Try this pressure cooker for quick cooking times! Quick cooking in up to 70% less time than standard cooking methods can be achieved using this Presto 8-Quart Aluminum Pressure Cooker. The contoured handle aids lifting of this filled pan. Aluminum cooking pan Transfers heat quickly, is strong and dependable in cookware. 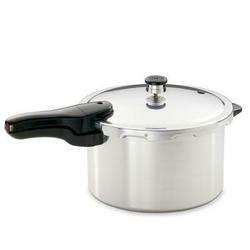 Long handle Is contoured for safety and easy gripping to lift the pressure cooker.